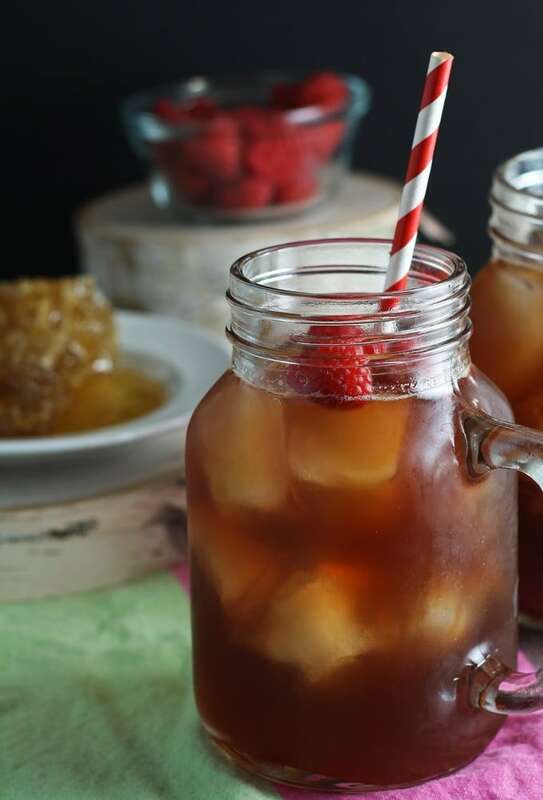 This raspberry sweet tea cocktail combines raspberry honey simple syrup, honey liqueur and bourbon with iced tea to make the perfect mixed drink! Last week, my sister and I did a little margherita pizza eating and Netflix binge watching. Boy, do we love our Kimmy Schmidt. We watched the entire first season in a couple of days and now are feeling that inescapable void. You know what I’m talking about. The void that comes when you have to wait another year for an more episodes of a show. I guess that’s what we get for binge watching the entire season in a coupon of days. Luckily, there is a ton of mindless TV for us to watch instead, if we so choose. But seriously, it felt nice to veg out and shut my brain off for a little while – I must schedule more downtime! We had brewed some iced tea to go along with our pizza snacks and there was still a lot leftover this weekend. Is there a better way to use up leftover iced tea than making a cocktail? I don’t thinks so. 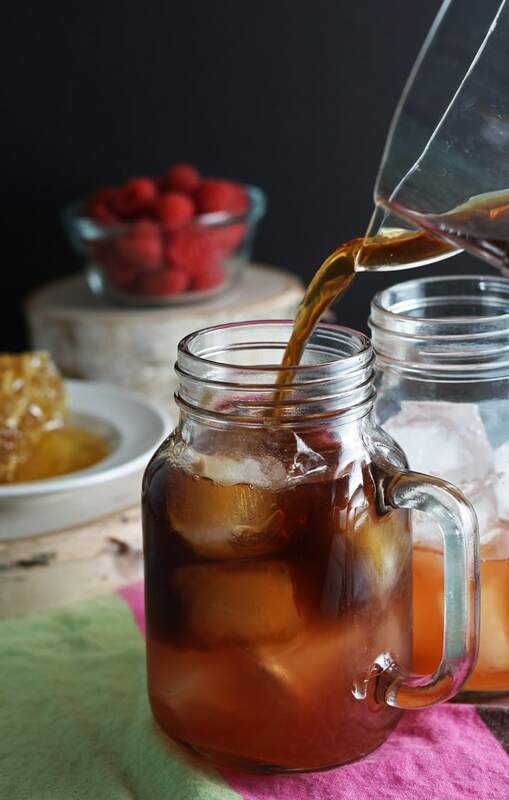 This cocktail is a combination of iced tea, raspberry honey simple syrup and booze. 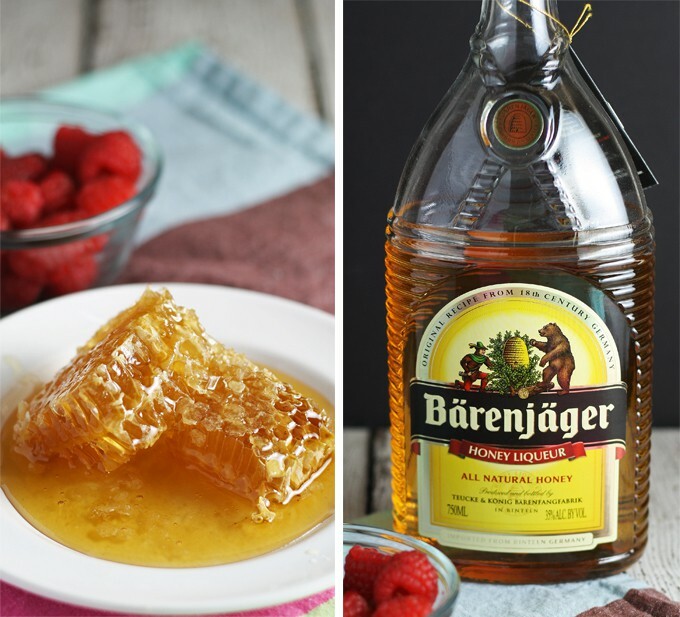 Raspberry honey simple syrup is very easy to make. We always have raspberries in our refrigerator since we use them as treats for Nero so I just added a pint to my simmering water/honey mixture. After straining the mixture into a bowl to remove the raspberry seeds, I let the simple syrup cool on the window sill before crafting my cocktails. 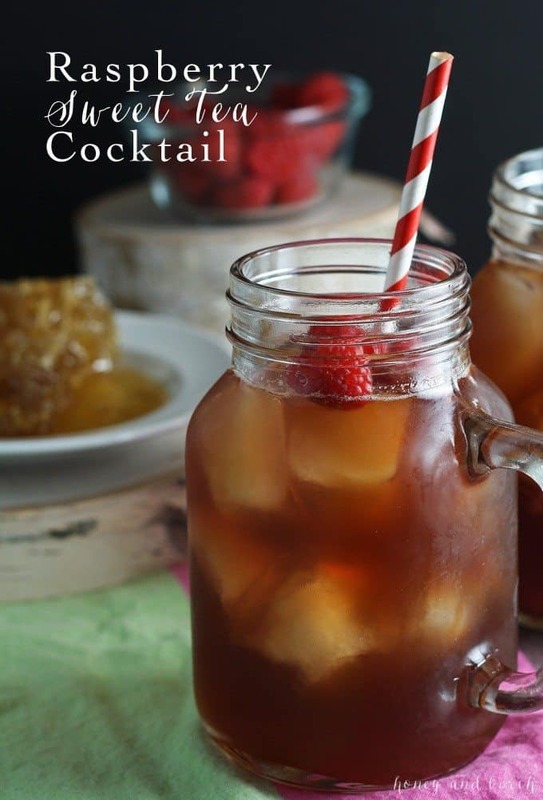 This sweet tea cocktail could easily be multiplied and would be great for outdoor barbecues – just change the measurements from ounces to cups. Also, either chill the mixture first or serve it without the ice so that it isn’t diluted by melting ice cubes. Combine ice, simple syrup, honey liqueur and bourbon in a cocktail shaker. Shake until chilled and strain into a glass filled with ice. Top with iced tea. Garnish with raspberries. In a small pot, combine the water, honey and raspberries and simmer over medium heat. When the mixture starts to boil, reduce heat to low. Simmer for an additional 5 minutes, then remove from heat. Strain into a glass bowl and cool before using. 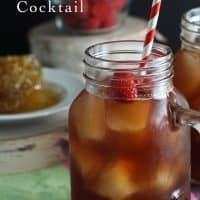 If you’re looking for some more raspberry and bourbon, try my bourbon and honey cocktail! This tea sounds delicious and refreshing, great for a relaxing afternoon of drinking and noshing with company. This looks so delightful. I love all the flavors in here and can’t wait to try! 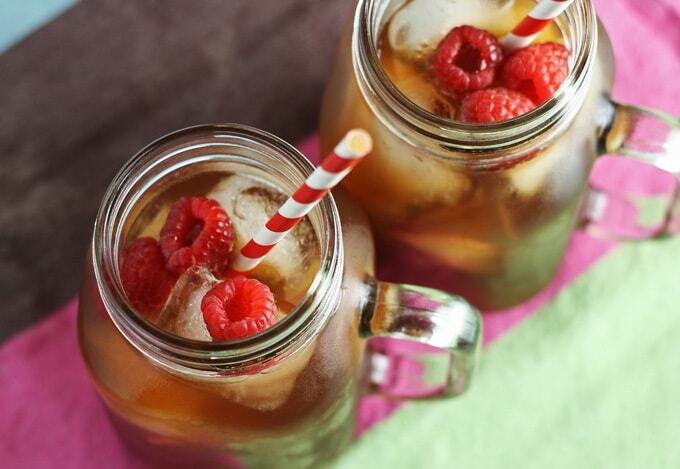 Sweet tea + raspberries + booze = my kind of heaven. Add in some Netflix binging and you’ve just about thrown it over the top. Love this! Thank you Denise! If you have a German restaurant near you and want to try before you buy, ask if they have it. I think on its own, it would be nice after dinner to sip on with dessert. Kristin, that’s super yummy too! This looks so delicious and refreshing! I am checking out this combination! Thanks for sharing with us at the Thursday Favorite Things Blog Hop! I have been totally into bourbon cocktails lately, so this sounds amazing! Thanks for linking up! thank you so much for linking up to #TipsyTuesday !! I am sooooo going to make this!! Awesome Pam – I hope you enjoy it as much as I do! This sounds so delicious and refreshing! Thanks for sharing at What’d You Do This Weekend? I hope you will join us again this Monday! Simple syrups are so easy to make and so tasty!! Thanks for stopping by! Haha, thank you so much for the feature Joy! Nice! I love fruity ice tea!